Participants at yesterday’s S.W. 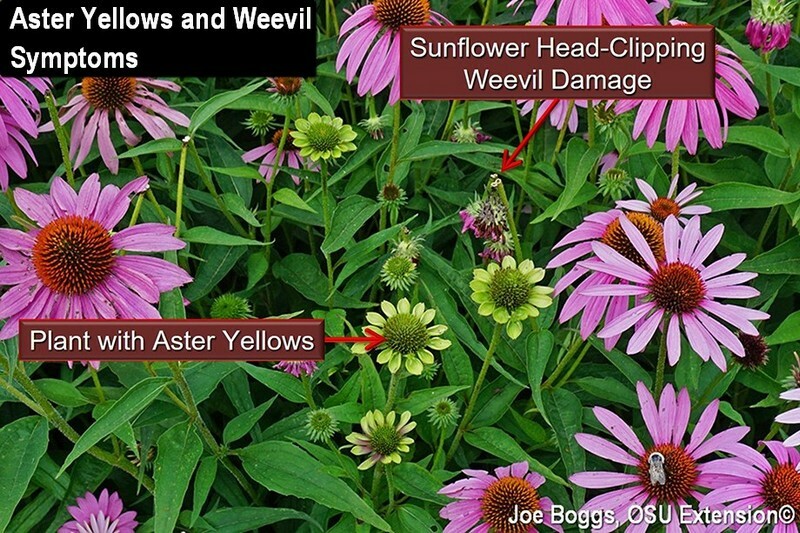 Ohio Diagnostic Walk-About viewed two problems on purple coneflowers; one potentially more calamitous than the other. The first was the handiwork of the Sunflower Head-Clipping Weevil (Haplorhynchites aeneus) which included dangling seed heads and stems that looked like soda straws. The second were stunted plants and deformed plant parts caused by the phytoplasma disease known as Aster Yellows. The weevil is a well-documented pest of cultivated and wild sunflowers (Helianthus spp.) in the Great Plains and is also known to infest other members of the aster family (Asteraceae = Compositae) particularly members of the Heliantheae tribe which includes both coneflowers as well as members of the Silphium genus. Indeed, the weevil is sometimes called the "Silphium weevil" owing to its strong association with plants in this genus. In recent years, the weevil has reared its ugly snout in Ohio to attack coneflowers as well as various members of the Silphium genus including compass plant (S. laciniatum), prairie dock (S. terebinthinaceum), and cup plant (S. perfoliatum). The shiny black to brownish-black weevil is a little over 1/4" long with the measurement including an exceptionally long, curved snout. As with all weevils, this beetle's mouthparts are located at the end of their snout. The females insert their snouts into the flower stems to chew a ring of holes around the stem about 1" below the flower head. The flower stem is not completely cut; the damaged stem just breaks-over causing the flower head to hang from the stem on a thin strand of tissue. Males and females move into the damaged flower head to feed on pollen and mate. The females then lay eggs on the dangling head. Eventually the flower head breaks from the stem and drops to the ground. Heavily de-flowered coneflower plantings look like a collection of soda straws. The eggs hatch once the flower heads drop to the ground and the weevil's grub-like larvae feed on the decaying flower head tissue. It is speculated that the odd head-clipping behavior reduces larval exposure to plant defense chemicals and also prevents other insects from competing for the seed head prize. Mature weevil larvae leave the flower heads and crawl into the soil to spend the winter. Pupation occurs the following spring to early summer and adults appear sometime in late-June to early July. There is one generation per year. Damage is mainly aesthetic, but the reduction in seed production could potentially cause a significant decline in natural re-seeding. The best method for controlling this weevil is to remove and destroy the dangling flower heads as well as heads that have dropped to the ground. This will prevent weevil larvae from completing their development. If the flower heads are removed gently to avoid disturbing the hidden adults, the heads can be dropped into a bucket of soapy water to kill the adults. This will reduce the weevil population and thus reduce damage to flower heads. Insecticides are not a viable suppression option. Insecticide labels will not support making an application to plants in full flower because of the substantial risk of killing plant pollinators. Remember: the label is the law! This serious, chronic disease occurs throughout North America and may affect over 300 species of plants in 38 families including a number of vegetables such as carrots and potatoes. However, as its common name implies, aster yellows occurs most often on members of the aster family and coneflowers are particularly susceptible. The disease is caused by a phytoplasma. All known forms of these small, specialized bacteria are plant pathogenic and they infect plant phloem tissue. Phytoplasmas are naturally spread from plant to plant by sucking insects, particularly leafhoppers. Symptoms of aster yellows include chlorotic, curled foliage; stunted stems; and bizarrely distorted flower parts. Flower petals may appear as a ring of tiny greenish-yellow spoons arrayed around the base of highly deformed cones. Cones may appear as tightly clustered rosettes. This symptom is sometimes mistaken for damage caused by the eriophyid mite commonly known as the Coneflower Rosette Mite, and vice versa. Aster Yellows wreaks havoc on all parts of the plant. There are no sprays that will suppress the disease and once plants become infected, they remain both infected and infectious which means they serve as a constant reservoir of the phytoplasma to be spread to other plants. Thus, sanitation is key to managing the disease. All parts of the plant including the root system must be removed and destroyed. As with all phytoplasmas, the Aster Yellows pathogen cannot survive outside of the plant so the bacterium will not remain in the soil.